In this issue: Star Kingdoms versus collapsing empires, Good Men versus Sons of Liberty, one general versus a galactic dark age—plus a David Weber contest! As the Solarian League collapses, rebellion brews. Success for Honor Harrington’s Star Kingdom against the League has bred dangerous times indeed. While freedom for millions hangs in the balance, one false step could lead to a final disastrous conflagration. On a near future Earth, Good Man does not mean "good" at all, but a dictator with ties to Earth's dark history of eugenics. A conspiracy hundreds of years in the making surfaces when the son of a dead Good Man takes hold of the reins of power, and finds he is most definitely not welcome among the elite. Now a revolutionary group known as the Sons of Liberty may prove to be the son's only ally in a fight to throw off an evil from the past that has enslaved humanity for generations. Sequel to Darkship Renegades. In collaboration with BuNine, the Honorverse research group and coauthors of House of Steel, we are pleased to announce the Honor Harrington Grand Alliance Campaign medal design competition for March. 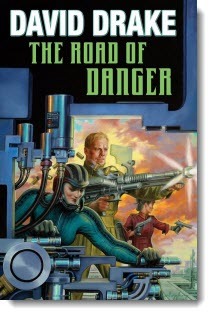 Entrants would create a design for the military decoration award to all members of the allied navies that fought against the Solarian League in David Weber’s Honorverse series. 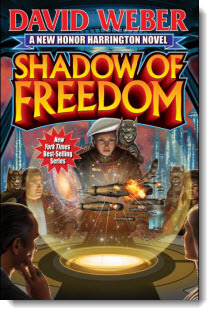 Winner will receive a free signed hardcover of the latest Honorverse entry, Shadow of Freedom. Humanity settled the stars, only to fall into a catastrophic collapse. On one planet, an ancient Fleet Battle Computer grooms a young military leader of grit and daring to make a final stand for civilization. 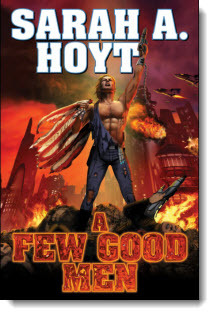 Contains the legendary General series novels The Forge and The Hammer together in one volume. Perfect introduction to new series novel The Heretic, coming next month. A heroic young woman seeks her origins as she comes of age on worlds touched by an ancient species seeking to claw its way back into existence. Two legendary Forerunner novels, Forerunner and Forerunner: The Second Venture, in one volume. The winner of the Liaden Universe® contest covers contest for February is Jennifer Smirthwaite from Cornwall in the U.K. Jennifer will receive a signed first edition of Sharon Lee and Steve Miller’s Necessity’s Child. John Ringo's Princess of Wands is a finalist in the fantasy category for the 2013 Audible Audie Awards. Larry Correia's Spellbound made the finalist list in paranormal. The Audies are given out each year by Audible.com for the finest in audiobooks. 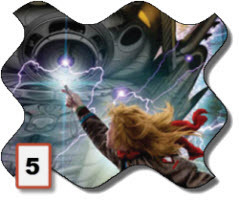 Don't forget to check out the latest Ebook releases here, plus Baen.com free fiction here, and don’t miss the monthly free nonfiction on brain-machine interfaces and the Brainship series here.